Buy 2 handpieces, Get 1 FREE! Prophy handpiece optimized for use with disposable prophy angles. Weighing in at just 62g, including the built-in 360° swivel, this anodized aluminum handpiece reduces stress and hand fatigue for the operator. Its short 4" length gives you less tubing drag and better posterior reach. 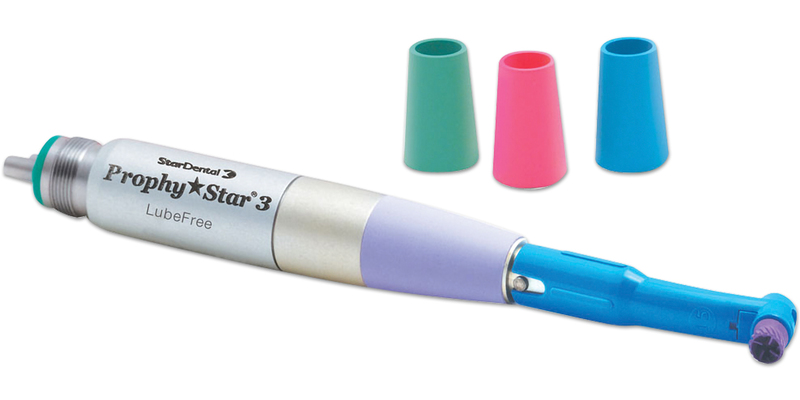 Ergonomic, autoclavable grips are comfortable to hold, and can be colorcoded by hygienist. Adjustable forward speeds up to 5,000 rpm. Connects to standard 4-hole tubing. Accepts any disposable doriot-style prophy angle. Lube-free and autoclavable up to 135° C.
You are welcome to use the Prophy Star 3 hygiene handpiece on a complete satisfaction guarantee basis; if you are not fully satisfied with this product, return it within 30 days for a complete refund. You may use one in your office on a trial basis; however, we can only accept the return of one unit in used condition. Contains: 1 handpiece, 4 rubber grips.